The ICC was developed in an effort to provide acceptable certification for cross-border operation of pleasure craft within Europe. However, it is not a European ‘licence’. It has been formally accepted by a few countries – including UK. Most others have not formally accepted it in law but their authorities have generally accepted it as evidence of competence in practice the ICC is a very useful document to have and most authorities will either accept it. Who Can Issue an ICC? In the UK, the RYA is authorized to issue ICC's to eligible people who can show evidence of competence. What Competency is Required to get an ICC? In the UK, ICCs may be issued to the following: UK nationals, bona fide UK residents (of any nationality), to nationals of the USA and Canada, and to nationals of any other non-UNECE (UN Economic Commission for Europe) countries. ICCs are issued for either power or sailing craft (yachts). ICCs for sailing craft can be issued to holders of RYA Day Skipper (sail), Coastal Skipper (sail) course completion certificates or Yachtmaster Sail Certificates of Competence. The ICC for sail automatically includes validity for power craft up to 10 meters. Procedure to Obtain an ICC for Coastal Waters.? Download and print an ICC application form from the RYA website – RYA.org.uk. If you have an appropriate practical certificate you can simply make a copy and send it to the RYA with the application and the application fee and a passport photograph. If you have trained with Hamilton Sailing we will assist you with completing the form. If you consider you already have the competence but have not done a Day Skipper Course, you can arrange for an ICC Assessment. This assessment comprises a practical test conducted by an RYA instructor aboard a yacht in coastal waters. 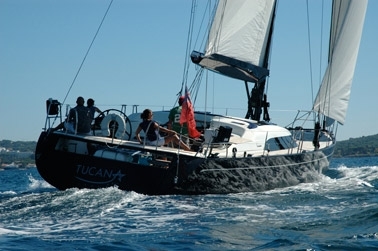 We do the test over one of our weekend sails, we include tuition on this weekend. The ICC (Sail) certificate is valid for sailing vessels up to 24 metres LOA and for power vessels up to a maximum of 10 metres LOA.